Fashion and music have a long-standing relationship. The two are oftentimes (if not always) inextricably linked, and the results are seriously synergistic. Musical artists dress in the latest fashions of the era, blazing new sartorial trails and setting the trends for the masses. While we're granted glimpses of musicians stepping out in our favorite designers and get to obsess over what they wear while walking the red carpet, it's through the format of the music video that we really get to appreciate this symbiotic fusion. Music videos serve as the visual incarnation of their songs, bringing to life what we otherwise could only imagine. With their stylistic sensibilities and immortalization of the looks currently en vogue, music videos also fix the art—the song and its visual identity—within a particular epoch of fashion. This past year has provided us with an impressive lineup of fashion-infused music videos boasting serious style. Keep scrolling to see what we've deemed to be the most stylish videos of 2016. To top our list is Beyoncé's highly anticipated visual album. 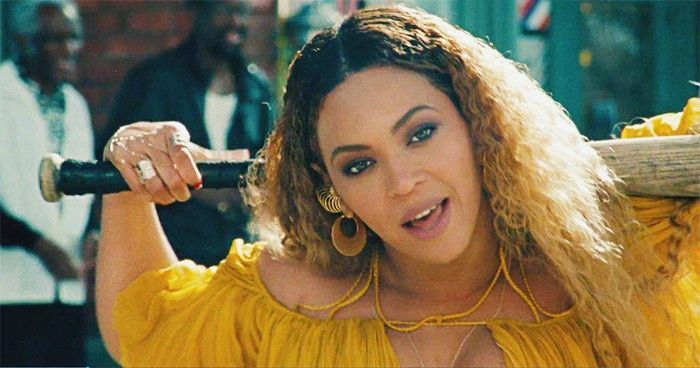 From "Hold Up" (that Roberto Cavalli dress and those Saint Laurent Candy Floral-Print Wedge Sandals, $995) to "Formation" (and her covetable catalog of dresses from Alessandra Rich to Gucci to Zimmerman), this art film is a visual buffet brimming with symbolic imagery, striking cinematography, and style to match. This captivating visual montage evokes the feel of a video lookbook, with the crooner and his red-headed companion parading around in pieces from Gucci's fall menswear (Børns dons head-to-toe Look 25) and Pre-Fall 16 collections. The singer is a favorite of the Italian house's artistic director, Alessandro Michele, so it's no surprise that he chose the brand to adorn his dreamy love story. Saturated with '70s style inspiration, this trippy 10-minute feature co-stars Father John Misty and a cult-like collection of ladies wearing airy, sun-bleached looks oozing with California cool. In this stunning video, Stefani dons an impressive lineup of high-fashion looks with costume changes including a red La Perla bustier, a Molly Goddard dress with Agent Provocateur bra, and Sophia Webster Delphine Lace-Up Over-the-Knee Pump-Boots. Prepare for an audio-visual roller coaster with this music video, which paints a captivating vision of a postapocalyptic world. This visual feast is complete with Versace sweatshirts, Comme des Garçons outerwear, and beauty looks so out there we can only hope this is what our dystopian future might have in store for us. Which video is your favorite? Head to the comments to share your thoughts!